Last week we received a call from KMSP-TV Fox 9 reporter, M.A. Rosko. She was charged with investigating a timely and very hard hitting news story… who produces all those delicious cheese curds for the Minnesota State Fair?! Well folks, that would be us. The Minnesota State Fair expects nothing but the best and as the “Cheese Curd Capital of Wisconsin” we gladly step in to take the role of main curd supplier; providing over 50 tons of curds to the 12-day festival (that’s about 110,000 pounds!). So we invited M.A. and cameraman, Chip, to Ellsworth for a visit. Top on M.A.’s mind was how we were going to supply all those many pounds of our world famous cheese curds to the guests at the upcoming fair. Were we going to have to work overtime? Was there a chance that we would run out? Joe Hines, Ellsworth Plant Superintendent, explained that after 35 years of providing cheese curds to the Great Minnesota Get Together, we’ve got it down to a science. We just continue to do what we do best; produce the freshest curds from the freshest and highest quality milk produced by our cooperative’s patron owners. The result is 160,000 pounds of fresh and squeaky curds daily for our customers’ enjoyment. Our team is skilled with managing the distribution of our product and we just know that the cheese curds produced the day prior to the Great Minnesota Get Together are destined for fair goers. Upon seeing the lines forming in our Ellsworth retail store, M.A. couldn’t resist getting her hands on the fresh curds of the day, which are available 7 days a week at 11:00am. Our customers weren’t at all shy about proclaiming their love of cheese curds, which made for some laughs that Chip caught on camera! We captured some of the highlights and posted the fun pictures to our Facebook page. And when you’re enjoying your corn on the cob from The Corn Roast, it’s going to taste even better now that you know it’s Ellsworth Creamery Butter slathered on it! Yes, the milk that comes to our Ellsworth facility is turned into cheese curds, but the cream is a different story. Our cream is shipped to a butter making facility and is returned to us as butter. 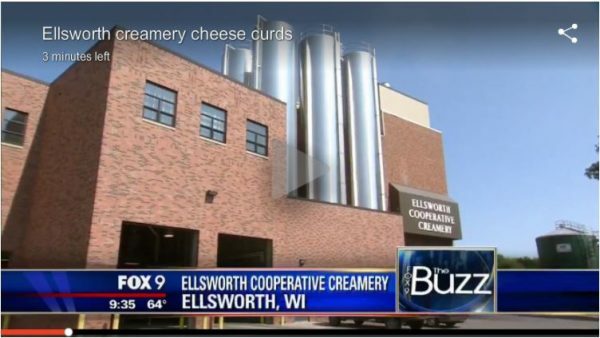 Milk of the highest quality makes the best cheese curds, and the same can be said of the cream that bears the Ellsworth Cooperative Creamery logo. WCCO’s Goin’ to the Lake Crew Visits Us in Comstock Get Your Grilled Cheese On!